A Celebration with, "The King"
Elvis is Coming Back to Town! Our Celebration will be held on Sunday, November 18th, 2018 at the Saxonia Hall in Aylmer. Plans for our show continue to evolve but we are pleased to present a Christmas with Elvis themed show with great music, fun and silent auction items. 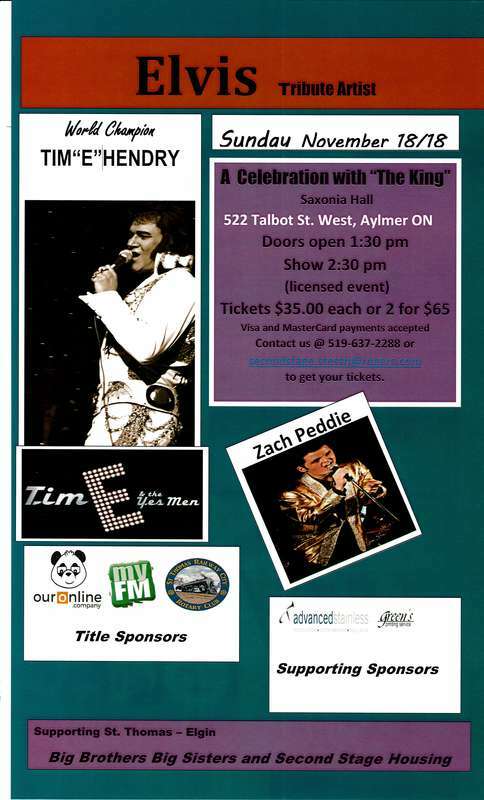 Doors open at 1:30 p.m.with local ETA Zach Peddie opening the 2:30 p.m. show followed by world renowned Elvis tribute artist Tim “E” Hendry. All Proceeds are supporting Big Brothers Big Sisters and Second Stage Housing of St. Thomas - Elgin. Big Brothers Big Sisters of St. Thomas-Elgin strives to increase the number of mentoring friendships with the children and youth in our community each year. The money raised will directly support Big Brothers Big Sisters mentoring programs which are being delivered to over 100 children and youth throughout Elgin County. Second Stage Housing’s proceeds will help to support their transitional programs for women and children that have left abusive situations. The ultimate goal of the program is to provide families with the support, knowledge and tools they will need to begin moving on from the abuse and to have a violence-free future. Please contact Carissa at 519-637-2288 or mmcleod.stessh@rogers.com to get your tickets available in the near future.